After last week of Moong Dal Cheela, which is staple at most North-Indian weddings or parties serving traditional menu, here is another delicacy. 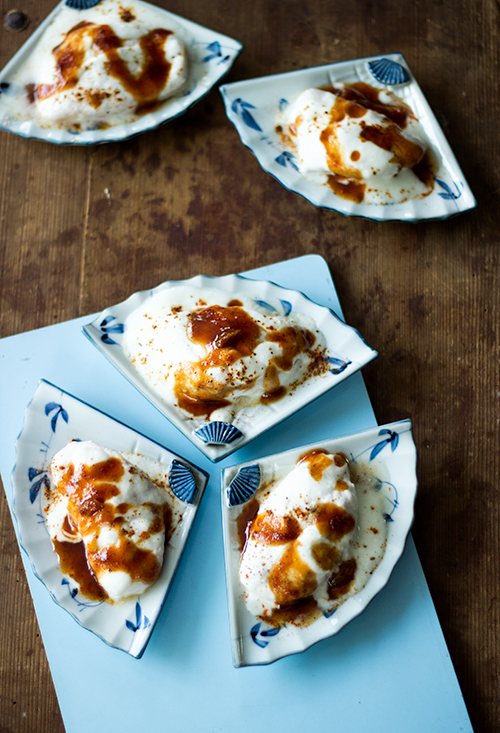 Dahi Bhalla as the name suggests is a dipped in thick, creamy rich curd and served with spicy and tangy tamarind-jaggery sauce and some dry roasted spices like cumin seeds. It is made of lentil batter and then deep-fried. Afterwards soaked in water to release extra water as well as soften it. It is usually very lightly filled with some chopped cashews and raisins. Most of Indian weddings, I skip the food as it is too rich, but Dahi Bhalla is a dish I just can’t resist. The trick lies in transferring the batter to the hot oil for deep-frying without splitting the dumpling open outside/ inside the oil or burning yourself. If you are careful enough, there is no reason, why you can not successfully make this at home. One such trick of transferring the batter I have already covered on LiG some time ago. In which you take a strainer and place the blob of batter on it and quickly release it in hot oil using the strainer. In this recipe, I will explain the traditional method of making bhallas using muslin and transferring it to the oil. 2. Soak the urad dal overnight. Wash and drain the lentil. Grind it into a fine paste using very little water. Mix all the ingredients under Bhalla together except cashews and raisins. 3. In a wok, heat oil for frying. Meanwhile, wet a muslin clot or an old handkerchief, squeeze it gently to remove excess water. Spread the wet muslin on the work counter. 4. Place a blob of batter on the muslin, sprinkle some chopped cashews and raisins. Press them gently. Now turn one side of the batter onto the other side of blob by holding the muslin and turning it over with the blob. It essentially folds the blob into half using wet cloth. 5. Lightly wet your fingers. Gently turn the wet muslin further and transfer the folded and filled blob onto your fingers and quickly release it in the hot oil. Deep fry till golden brown. Repeat for as many bhallas you want to make. 6. Place the bhallas 1 hour prior to serving in water. Allow them to become soft by absorbing water and releasing extra oil. At the time of serving, remove them from water and gently squeeze them without breaking. 8. 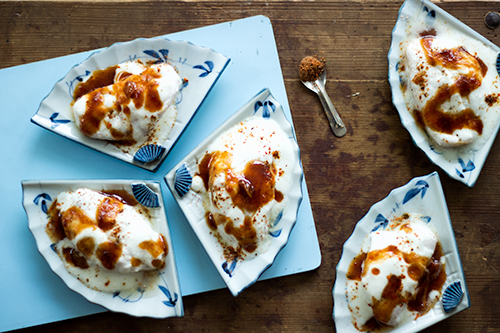 Prepare yogurt gravy by mixing cream and curd together in a bowl. Add salt, and other spices. Dip the soaked bhallas in the curd bowl and allow to soak for another 10 minutes. 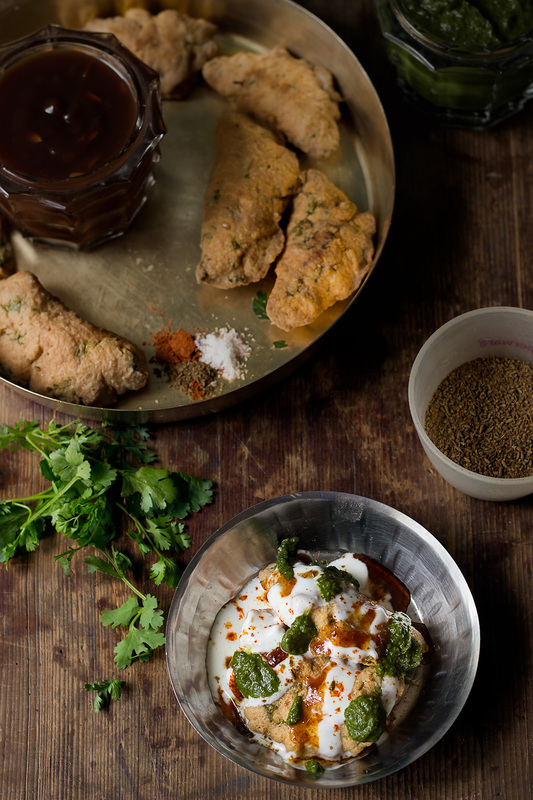 For serving, remove the curd-soaked bhallas onto a platter. Pour some more curd-cream mixture if required. Sprinkle salt, pepper, roasted cumin seeds to taste and tamarind-jaggery chutney. Serve cool. Instead of turning the folded blob on your fingers, you can transfer it to the underside of strainer as explained here and quickly release in the oil for frying. You can also use a milk bag (plastic) in place of wet muslin. The process of removing the dumpling from plastic is much easier and convenient. After deep-frying the bhallas you can store them in air-tight container in refrigerator and use as and when desired.